The book “Pie: An Old Brown Horse” by Kandy Kay Scaramuzzo tells the story of Pie from his very own point of view. The reader follows Pie's life from the time he had an accident that rendered him incapable of continuing his job as a cattle herding horse and learns about various incidents in his life. The gentle, slightly cocky brown horse is moved to a stable where the owner wonders whether anyone would ever be interested in buying such an old horse. She fattens him up, lets the wounds heal but for a while people always seem to be more interested in prettier, younger horses – until the “little one” takes an interest in Pie. The two get along very well but there are still quite a few adventures ahead in Pie's life. He'll have to live through a meeting with Akitas, he has to watch other horses suffer and even go mad and he also learns a different job: to be a riding horse, not just a cattle horse. There is a lot going on in the life of that old brown horse. Reading the book “Pie: An Old Brown Horse” by Kandy Kay Scaramuzzo was at times funny, but at other times heart-wrenching and sad. The book is written in a relatively simple language and even if you are not a horse person, it will not be a problem for you to understand the book as many things about horses are explained by Pie himself. He seems to be a really clever horse and a very good observer of the world around him. It is a pity that the photos in the book aren't in color but they still add character to the story and it is very easy to feel that you actually know the horse yourself. “Pie” is a story for people who like animals and is a nice entertaining read. Great story of Pie's life. What a interesting horse he is. Any animal lover will enjoy this book. Writing a story in the first person is not uncommon, but when that first person is a horse, well, I really wasn't expecting it to actually be entertaining to say the least. Thankfully since I have such a huge admiration and respect for horses, I decided to give it a read. What a pleasant and thoroughly enjoyable story this is. The title is a little misleading. Pie may be an old brown horse now, but he was nothing of the sort during the story. Kandy brought that personable horse to life like he was almost one of us. As we all know, animals have feelings, thoughts and ways to communicate just like we do. Even though some, and maybe a lot of people, don't think about this in a very in depth way, Kandy proves that to be our oversight and sadly our loss. Because as you read the story, the thoughts, and emotions of how Kandy presented these majestic animals is nothing short of enthralling, entertaining, and enlightening. As you learn from this book, taking care of a horse or more, is not for the faint of heart. It is work, money, time, and emotion, but the rewards are so much greater than what is given, that the comparison is actually impossible. For those who do it and have done it, like the owners of Pie, they wouldn't trade it for the world. Pie calls the owner, keeper. His love, thankfulness, appreciation and admiration of keeper is obvious, and just as obvious is, it's well deserved. I am sure the keeper is the author, and I am sure you will see, as I did, that the spirit of the keeper is nothing short of incredible. It is apparent that unconditional love is as central to her core as the automatic beating of her heart. People like this should be respected and emulated. Pie knew this and showed her and his charge, little one just how much love he had to give back. Pie is a lucky horse that has had an amazing life. This is a great story that tells you about his life from where he is at the end of his working career on a ranch and struggles he endured from a injury to becoming a therapy horse for special needs children. You get a chance to look into the life of a horse that has been through and seen a lot in his life taking you on a journey of his life after meeting his keeper and introduces you to his many friends he meets along the way.You can feel the strength in the connection he has with little one that only they will ever understand. This is a great story that's shows when yu have strength and will good things can and well happen to you. This book, narrated by the horse himself, is such a great story about friendship, loyalty, love, and trust between humans and horses. It left me feeling better about the world in general, and wishing I had a horse! This is a marvellous story, told through the eyes of Pie (the old brown horse) himself. Pie had worked all his life on ranches until, having been gored by a bull and tangled in wire, he was left to languish in a small pen to recover or die. His working career as a cattle herder, and possibly his life, was over. He was no longer of any use to anyone, added to which he was already past retirement age. Then, having been bought by a livery keeper for resale, Pie's life changed. A young girl came to know him well, and, having had an unfortunate experience with another horse, decided she wanted to buy him. From there he was brought back into work, a much gentler sort, and made useful again. 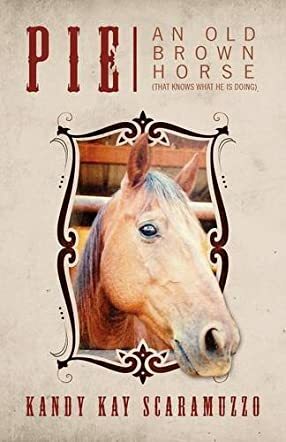 This story takes the reader through the trials and tribulations of Pie's life from the time he was gored until he is fully established as a therapy horse for autistic children, and on to his life as it is today. Despite my passion for horses, I have to admit, I had no idea how things worked in Pie's first life, and rather enjoyed reading about it. The lot of a cattle herding horse is a fairly hard one by all accounts, with few comforts to speak of. That is not to say they are mistreated in any way; it is just hard work, long hours and few luxuries. I strongly suspect the lot of a cowboy is just as tough. All of which is wonderfully and humorously described in the text. Kandy Scaramuzzo has her own free-flowing style of writing, which I found rather endearing, through which her inordinate love of horses, and her way of life, shines through on every page. The written interpretation of the communication between the horses tells us a lot about the authors understanding of them and their behaviour. The scene setting is perfect and the characters, both human and equine, are all vividly and entertainingly described in this heart-warming tale. The story of this remarkable horse touched my heart and I am pleased it has been told. Cleverly written from Pie's unique perspective, the reader is not only able to get to know Pie; a horse whose demeanour is bursting with courage, understanding and a sense of what is right, but also learn that all things have their place in life. Pie shows us that being old does not mean being without worth. Brimming over with enthusiasm and ever eager to please, he displays compassion and understanding in all things. And, there is no doubt - he does know exactly what he is doing. His loyalty to the herd, especially those he is close to, is to be admired. His assessment of them and all their individual peculiarities seems spot on, and he always tries to do his best for them. Plus, he's a hoot. He is certainly an extraordinary horse who has impacted on many lives with these attributes. In fact, his whole disposition made him the perfect choice to place with children who have special needs. Pie's enlightening memoirs are a wonderful eye-opener into the fascinating mind of this intelligent, heroic and warm-hearted old horse. I am just sorry I will never be able to meet him in the flesh. I normally do not read books about animals and I have certainly never read a book written by a horse, but I must say that I thoroughly enjoyed reading Pie's narrative. He is an excellent storyteller and I was hooked from the beginning. I highly recommend this book and I hope he writes a sequel! In the beginning of this story, we find that Pie is an old, wise, horse who endures the trauma of a horrific accident. Many owners would have considered sending the elderly fellow to horsey Heaven, but Pie is blessed. He finds his way to a wonderful, caring family. He takes care of his owner, "Little One," with whom he has lots of exciting adventures. Pie and Little One develop an extraordinary bond. Pie even brightens the lives of children with Autism. He goes to great lengths to protect his special passengers and keep them safe. You'll also meet several of Pie's horse friends and find out how he assesses their personalities perfectly. He is forever loyal to his friends, even putting himself in harm's way to shield them. Pie's story is an extraordinary one. The message it conveys is most important. Every animal lover will treasure it! Pie: An Old Brown Horse is a really cute story about an older brown horse that makes his way from a ranch into a loving home. The story is told in Pie's point of view. I was brought to tears a couple times by the touching stories about his barn friends. I was captured from the 1st page! Absolutely Loved this Book!! Would recommend to all Horse lovers! Really neat perspective from the horse! LOVE LOVE LOVE!!! Pie: An Old Brown Horse is a beautiful work in the tradition of "animal memoirs" like Black Beauty or War Horse. Told from the horse's POV with an enchanting cast of supporting characters, this book is an easy pleasure to read. The perfect book to set on your nightstand or coffee table and read at your leisure. The author has a lovely insight/empathy into the hearts and minds of our animal friends, and the book would make a wonderful introduction for young people to gain greater appreciation for all creatures great and small. Highly recommend! this is one of the best horse books I have ever read. I read it in less then two days because I could not put it down. The true story of Pie written from the horse's point of view is ingenious. It allows you to become the horse and see everything through his perspective. I laughed, I cried and I had uh huh moments about my own horses. This book is a must for anyone who has ever dealt with horses or loves horses. You'll never look at your horse or any other horse the same way ever again after you are done with this book. The old brown horse really does know what he is doing. Pie is a great story to read for young or old! Children would really enjoy learning how a horse thinks and maybe create that kind of relationship with their own horse. I don't think enough horses have told their stories! Thank you so much for letting Pie share his, me and my children truly enjoyed it! In the old fashioned style of the classic Black Beauty, this story unfolds from a horse-eye-perspective. Pie is a skilled cattle horse who survives near death injuries while corralling a bull. He finds himself discarded by the cowboys that have been the corner stones of his world to be stabled and sold. However, this is by no means the end of his story but rather the beginning as he finds his human to love and continues to have amazing adventures. The book moves at a good pace and is broken into many little horse tales. I say Bravo for Kandy Kay Scaramuzzo at capturing the mind of the horse perfectly. This story touched my heart and I think that horse and animal lovers everywhere would enjoy the read. pie is a very interesting book written about a horse. And this about a real horse not an imaginary one. This book kept my interest from start to finish. Pie, a ranch horse, suffers from an external mid-life crisis where he is injured after a brief encounter with a rowdy bull. Too damaged to continue his work, he is "put out to pasture" where the second phase of his life begins, which is surprisingly better than his first. Pie is a multi-layered memoir about second changes, perseverance, and the power of bonding. Author Scaramuzzo has craftily managed to write an effective, feel-good book despite highlighted tragedy throughout. Told entirely through the point of view of Pie, this ordinary old brown horse shares his optimistic outlooks, fears, and subtle humor, as though the reader had stumbled upon his personal diary that he kept hidden at the back of his stable. Along the way, he meets a cast of characters, both human and animal, where they inspire and enlighten each other's worlds. This is not only a remarkable story on its own, but any lover of animals who understands the personal connection that is shared between pet and owner will have a heightened appreciation as Scaramuzzo expertly focuses on the importance of connections and interactions that both animal and human inherently give to one another. Pie is a regenerative tale for all ages. This is a great story about a wonderful horse and a mutually wonderful owner. I'm a horse lover but Ms. Scaramuzzo's love and care for all animals, not just her horses, is far beyond the call of duty. Everything she does is in the animals' best interests, to give them the best quality of life possible in what's usually a "me-first" kind of society. I felt warmly welcomed into her world while reading Pie's account of his life with her. My best friend says she hates to come to an end of a good book because it's like having to say good-bye to a good friend, and that's how I felt after finishing "Pie." I have worked with horses my whole life and Ms. Scaramuzzo's instincts and interpretations she attributes to Pie are exactly in line with my experience. I'm in awe of the expense and effort she went to as far as special diets, medications and vet bills for whatever horse in need of whatever care. The recollection of her protection of poor Gunner, not abandoning him to wild dogs at the risk of her own safety, was nothing short of heroic. I wish all horse people cared as much as she does for these animals who continually give of themselves to us. I definitely agree with her about the clannish-ness of some horse shows; it can be really terrible. Good for her and her "little one" to keep competing anyway! There is a shortage of really good horse books so I thoroughly enjoyed each page of this "days of the lives" word picture of those blessed to be in Ms. Scaramuzzo's care. I hope it speaks to those horse owners who may not be as experienced as she is, to the proper care of their animals. This book radiates pure heart and I loved every second of it. Thanks for writing such a heartwarming story from Pie's perspective. He is a very lucky horse. This true story will make you smile and feel good inside. What makes it so fun is that Pie tells it from his own horsey perspective. What makes it so inspiring is that he tells how a few special people gave him a second chance in life. He repays the kindness with love and loyalty. The people and the horse have a profound impact on each other over the years as they share many experiences - some funny, some adventurous, some heartwarming. Enjoyed Pie's story very much. The author really gets inside Pie's head and is able to put it to paper. As a whole, this was a phenomenal read. This novel made me laugh so hard that I fell off my chair. Everything is so realistic yet off the wall that you can't help but laugh at some of the situations that Scaramuzzo presents in this story. It also brought tears to my eyes at times, and made me full out laugh at others. Pie's story is one of survival, courage, companionship and true friendship between horses and people who care and love them. So saddle up and allow Pie to take you on a journey, at times it is like a stroll through an open feild on a breezy summer day, other times it is a gallop through a wintry storm or a fun canter along a winding trail but no matter what the weather, it is all one heck of a ride! You'll fall in love with Pie and all the horses in the stable as Pie tells his tale so eloquently and majestically. He is a wise old brown horse that has lived quite a hard life until he is lucky to come into the care of someone with so much compassion and understanding. Children of all ages will want to read this story and encounter this magnificent animal with his caring old man soul that works its magic on all those who have the opportunity to meet him. If you have ever loved a horse, if you have ever known a little herd of horses whose personalities delighted you daily, if you have ever experienced that lasting bond between a horse and their person, if you have ever watched a horse help a child to grow up strong and confident, then you need to read Pie's story and savor all of this once again. If you haven't experienced any of those things, then I need to warn you. There are side effects to reading this book. As you read you will experience an increased desire to be best friends with an Old Brown Horse. You will want to be soul mates with a wise, sturdy cow horse who knows what he is doing, a horse like Pie. But we can have the next best thing to going to the barn and feeding Pie baby carrots and seeing him in his handsome blue blanket... we can read Pie's recollections of life and his thoughts about fellow horses, his people, the places he has been and the events he has lived through! How would a tough, smart cow horse feel if he were injured by a raging bull and left alone with his wounds in a little pen for a long time... and then one day is taken to a stable where he is surrounded by other horses of all dispositions, loved by people, and given a lot of new purpose? How would he feel to suddenly have his own person, little one? Will Pie the therapy horse be able to help the children who come to ride with him? Will they trust this big, gentle animal and will they be blessed by their time together? We can find out by reading Pie. And I suggest you do. All the wisdom of an old brown horse is distilled in these pages, leaving us with lessons on life and a very enthralling story. Written in a way that brings Pie's memories to life, through this book we are able to experience all the happenings at the stable: from Rebel the dainty horse who was allergic to fly bites to RC, the huge raccoon that visited each morning and ate cat food. I am very glad that I had the chance to receive Pie from Kandy Scaramuzzo to review, and I am happy to add this book to my family's library. This is a book that all horse lovers and owners should read. Not only is it in a horse's point of view but it tells many different stories of not one horse's life, but many others as well. Pie is a special horse, his past was fulfilled but unfortunate to have had such an ordeal happen to him. All in all, some things happen for a reason and it sends not only humans in the right direction, but horses too. He was destined to meet his "Little One." His life was fulfilled once again, but with the love of a little girl. He has imprinted his life fully on so many and lives a legacy for many others to follow. Pie not only made a difference in many families' lives, but as well in many horse's lives. He knows his job and meets every obligation to the fullest, but still stands back and recognizes what is happening around him. His life story will not only become a treasure for many horses, but for many people as well. He sees things in a special way, a way that is told from wisdom. This book is so special because it not only has a wonderful tale, but lots of helpful information too. Any horse owner can recognize the care routines, and the different personalities of many horses. Horses have so much under that beautiful image they hold, they are so much more. The author really captured the care and strategies that it takes to be a horse owner. What it takes to have the compassion for horses. I love the details about all the different horses and how the author gives the descriptions at the end of the book. You feel as though you are at the stable watching all of the horses share and grow their lives together. I am so glad that Pie's story has been told, for he will always carry a legend in my heart. This is a great book. Fun and heartwarming. A great read for all ages. My horse crazy 10 year old loved that it was told from the horses point of view. Pie really does know what he is doing! A fun read from the perspective of a horse that seems to have it all together. Enjoyable for all horse lovers. It was with great pleasure that I read this book of a horse's life from the horse, PIE's point of view. Although flavored with a strong dose of humor, the common-sensical way that PIE recounts his life story and observations is irresistible. No punches are pulled and there are realistic accounts of violent action as well as more delicate and emotional twists and turns. All in all, a very satisfying read! I am lucky that I grew up in a place where could get to know horses. In Navajo legend when the world was divided horse and dog jumped over the crack and stood with man. I have been allowed to have several horse friends in my life. This story about Pie is in a word wonderful. The idea of allowing an old horse to tell his own story is not only innovative but pushes the bounds of what great writing should be. A friend who knew of my love for horses asked me to review this book and sent me a copy. Kandy has surpassed her own high standards with this one. This is a book That I will read again and again. I intend to order it in a hard copy because it is a book that I want on my shelf. My father was the stereotypical Texas Cattleman. He once told me that certain horses could educate you if you knew how to listen to them. My horse teacher was named Cheyenne. I think he and Pie would have liked each other. If you love horses or just always wanted to have a horse friend you need to read this book. I can not recommend it higher. I gave it five stars because they would not let me give it ten.